Adam Gatchel is a Craftsman and the Founder of Southern Lights Electric Co. His love for mid-century design and the functionality of Industrial pieces led him to develop rustic lighting décor. Each light uses very raw and unfinished materials, but when combined together create something with beautiful form and character. The Rustic Bell Jar has a satin Nickel light socket, with cloth-covered wire and an inline switch. The light uses an Edison style light bulb that adds even more character to the fixture. Southern Lights Electric Co. adds some industrial charm to your home, office, or retail space. Adam Gatchel is a Craftsman and the Founder of Southern Lights Electric Co. His love for mid-century design and the functionality of Industrial pieces led him to develop rustic lighting décor. Each light uses very raw and unfinished materials, but when combined together create something with beautiful form and character. 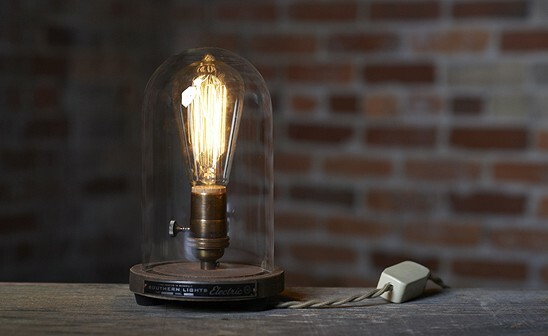 The Rustic Bell Jar has a satin Nickel light socket, with cloth-covered wire and an inline switch. The light uses an Edison style light bulb that adds even more character to the fixture.